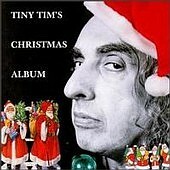 In these most cynically pseudo-cool of times, when even Cheryl Ladd albums change hands at the most preposterous of prices, what a relief the true musical treasure known as Tiny Tim is finally receiving the critical reassessment he's deserved for so long. What a relief as well that the good folk at Rounder have made available again an album's worth of seasonally delightful sounds from Tiny's 1993 Christmas sessions in Sydney, Australia (! ), for what the Man and his Voice can do to all your Yuletide favorites is, in typical Tim fashion, a wonder to behold. Yes, he raps (his scoldful soliloquy in the midst of "Silent Night" is worthy of an Edward D.Wood rant), he scats (just listen to him tackle Mel Torme's "Christmas Song"! ), he rocks, swings, and, yes, trills his way through a program that will amaze and astound even the most hardened of you alt.lounge lizards out there. In short, this is a Holiday offering that is as absolutely timely as it is timeless. For you see, in the hands of an earnest, trusting, and most talented soul such as Tiny, any melody, and any lyric especially, is rendered defiantly and heart-warmingly kitsch-proof in its sincerity of performance, and while that may not bode well for the man's rep amongst this year's modem-heads, rest assured Tiny Tim's Christmas Album will be around for many, many Decembers to come. God Bless You, Tiny, wherever you are!